Shear Material: the process of getting rectangular workpiece by shearing machine. Using numerical control shearing machine for net size blanking, this is specially applied in piece processing with lower demand, most of the process engineer use shearing machine for blanking to reduce the processing cost. CNC Punch: refers to the use of CNC punch press for hole punching, normally programming first, the key points for CNC punch is discharged and calculate the using of materials, and then complete the number of pieces for processing in one-time. Laser Cutting: refers to the process of the workpiece by laser cutting. The processing cost is high, the process engineer should use this technique less. Cutter Blanking: refers to use a kind of grinding wheel electric cutting machine for cutting process, this is for workpiece processing which demand is not high, most of the time for profile steel processing. This process has certain processing security risks, process engineers should use this blanking method less. Saw Material: it refers to the process of using a sawing machine to carry down the material. This is not a high requirement, and it is mainly for section steel blanking. Blanking: refers to the process of processing the product shape by using the mold on the ordinary punch or other related punching equipment. Perforation: the process of the workpiece for hole punching by ordinary punch press and die. Bending: the process by which the workpiece is formed by a bending machine. It refers to the CNC bending machine, with the corresponding bending molds to finish bending purpose. First start commissioning, inspection before production. If there are special needs, process engineers should explain it first. Punching Folding: it refers to the installation of special molds on ordinary punching machines for the bending of small pieces and simple workpieces. Forming: the process of using the mold to deform the workpiece in the ordinary punch or other equipment. Perforation: also known as “turn over”, refers to the process of round hole flanging forming of the workpiece with die on the ordinary punch or other equipment. It is to refer to use the ordinary punch, add special mold to carry on the need to increase the thickness of tapping, when the craft engineer makes the craft, he must add careful specification on aperture and quantity. Drilling: refers to the use drilling machine for drilling, when it is not convenient for CNC punch and normal punch to process, using artificial to finish small amounts processing, normally draw the line and positioning the drilling point for drilling process, process engineers should use this process less. Die Plate Drilling: it means to process a piece of plate with a number of punches, and then use the positioning method to conduct batch drilling. Tapping: the process of processing internal threads on the workpiece. Broaching: the process of machining a small hole into a large hole with a drill or milling cutter. Countersink: the process of machining a tapered hole in the workpiece to fit a connecting piece like a countersunk head screw. It is referred to use drilling machine, use the appropriate drilling head (90 degrees, 120 degrees), have to use the countersunk screw to make a real match, normally, leveling the surface of countersunk head screws and the surface of workpiece sinkholes, producers must use real match method. Pressure Riveting: the process of pressing the riveting nuts, riveting screws or riveting nuts to the workpiece by punch press or hydraulic press. Normally, the direction of the pressure riveting is in the direction of the burr, so that the pressure riveting can be loaded smoothly. If not, the producer should report it in time. Rose Riveting: refers to the process of pressing the workpiece to the hole first and then using the punch or hydraulic press to press the riveting nut firmly to the workpiece. Pull Rivet Nut: refers to the process similar to riveting. Using a rivet nut pull shot to pull rivet nut (POP) and other connectors firmly connected to the workpiece. Pull riveting: the process of connecting two or more workpieces closely together with a riveting gun. Riveting: the process of connecting two or more pieces of workpiece face to face with rivets, if the head is riveted, the workpiece must be sunk first. 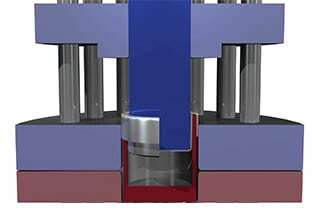 Punch Convex Hull: the process of forming a convex shape in a punch or hydraulic press with the die. Punch Tearing: also known as “punch bridge”, refers to the process of making the workpiece shaped like a bridge in a punch or hydraulic press. Punch Print: a process that uses a mold to dash out words, symbols, or other marks on an artifact. Cutting Angle: refers to the process of using the mold to remove the workpiece angle on the punching machine or hydraulic press. 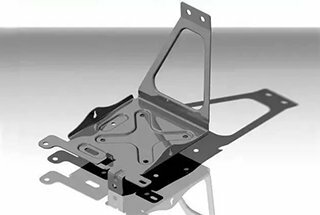 Punching Mesh Hole: a hole that is perforated by a mold to the workpiece in a normal punch or CNC punch. Leveling: refers to the process of leveling a certain shape. Drilling: the process of drilling the workpiece with a drill bit on a drilling or milling machine. Chamfer: the process of processing the sharp corners of the workpiece by means of mold, file, grinding machine and so on. Calibration: refers to the use of machines to smooth the workpiece before and after the workpiece is processed. Return Screw Teeth: the process of the repair of the second screw thread for the workpiece with the tooth in advance. Pasting Protective Film: the process of protecting the surface of the workpiece by using a thin film that can protect the surface of the workpiece. Tear Protective Film: refers to the cleaning process of the surface protection film. Proofreading Form: the process of adjusting the workpiece that has been processed. Thermal Shrinkage: the process of tightening the plastic of the workpiece by using heating equipment (hot air gun and oven). Labeling: refers to the process of placing the label on the designated position of the workpiece. Drawing: refers to the process of using a wire drawing machine and sand belt to process the surface of the workpiece. Polishing: refers to the process of polishing the surface of the workpiece with polished equipment. Heat Treatment: the process of special treatment for improving the hardness of the workpiece. Deburring: refers to the process of smoothing the workpiece by removing the edges of the workpiece by means of grinding machine, file and other tools during the process of sheet metal processing. Argon Spot Welding: refers to the use of argon welding machine for spot welding. It applied to the process with high welding quality, normal welding spacing is around 30 to 50 mm. Argon Full-Length Welding: refers to the use of argon welding machine to do the full-length welding, mainly applied to the process which requires high quality, there can be no deformation after full-length welding. Touching Welding: also been called “spot welding”, refers to the process of welding the workpiece face to face with the touch welding machine. CO2 Protection Welder: refers to the use of co2 gas shielded welding machine for the welding operation, it is applied to the common welding quality requirement process, normal welding spacing is around 30 to 50 mm. CO2 Protection Full-Length Welder: refers to the use of carbon dioxide gas shielded welding machine for the welding operation, mainly applied to the process which requires high quality, there can be no deformation after full-length welding. Stud Welding: also known as “seed welding”, refers to the process of welding the welding screws firmly to the workpiece by means of a stud welding gun. Welding Grinding: it mainly refers to the process of smoothing the workpiece by means of grinding machine and file. Use the hand-held electric power grinder to polish the welding parts, for the workpiece with the high requirement for electroplating, spraying, it should use the special grinding wheel (sandpaper) / 120. Pretreatment: refers to after completion of sheet metal processing, before spray paint or powder spraying, degreasing de-rusting and increased surface coated (such as phosphating film) and cleaning in the electrolytic solution. Scraping Ash: the process of making up the surface of the workpiece by using atomic ashes, such as welding seams or pits. Blowing Ash & Grinding: mainly refers to the process of surface polishing by means of grinding machine or sand cloth for the workpiece after dust scraping. It refers to a kind of repair process of the workpiece surface grinding by a pneumatic grinding machine, which is the normal only in the process of filling the process. Spray Paint: the process of spraying paint evenly on the surface of the workpiece with a special spray gun. Spraying: spray by spray gun or disc type atomizer, by means of pressure or centrifugal force, disperse into a uniform and fine mist, applied to the coating on the surface of the workpiece. Protection of Spray-painted Threads: it refers to a kind of rubber cover used to protect the nuts, bolts and nut bars. It also can be fine adhesive paper, high-temperature glue paper, protective casing. Spray Conductive Protection: it is the protection of specific areas with high-temperature adhesive paper. If such requirement is required, process engineers must make special instructions. This protection is carried out by the assembly line. Silk Printing: refers to the process of forming text or pattern on the surface of an artifact with special ink. Require no defects after a series of inspection such as adhesion, resistance to organic solvents, chromatic aberration, font and so on. 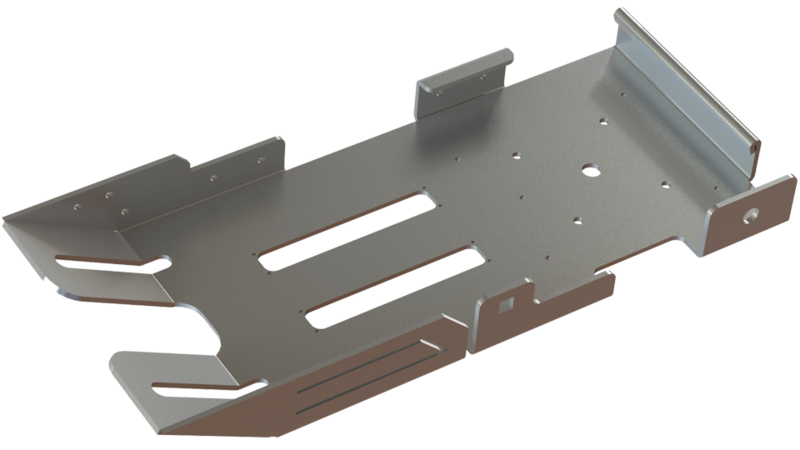 Electro-galvanizing: the process of plating a layer of metal on the surface of the workpiece for protection or beauty. 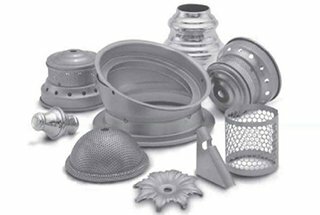 Electro-plating Nickel: a process of coating metal on the surface of the workpiece for protection or beauty. Oxidation: the process of forming an oxidation film on the surface of the workpiece for protection or beauty. Sandblasting: the process of processing the surface of the workpiece by sandblasting machine. Assembly: refers to the process of assembling two or more workpieces together. Packaging: the process of protecting the workpiece and making it easy to transport. Positive CNC Punch Graphic Plane: the figure of surface requirement process must be shown as positive, the symmetry piece must unify the burr direction, don’t directly apply this surface as a negative, the follow-up process engineers must improve, reporting timely if found similar problems during production. The burr is Up & The Burr is Down: the drawing quantity shall be specified in the technical requirements. Pressure Rivet Down & Pressure Riveting Upward: the drawing quantity shall be specified in the technical requirements. The Sinking hole up & the Sinking Hole Down: the drawing quantity shall be specified in the technical requirements. 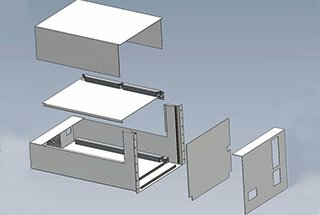 Programming: refers to the programming software installed on the equipment by manufacturer, in special computer processing the production order with CAD drawing files, normally, should use the least amount of punching time and must form the edge after trimming. Borehole Tooling: it refers to a mold plate for manual drilling positioning, which should be considered by the process engineer in the process of making the product. Welding Tooling: refers to the technical requirements of welding dimension, angle, position, space size and other technical requirements, which shall be considered by the process engineer in the process of making the products. Spray Conductive Protective Tooling: it refers to for large area of spray protection, iron plates fixed installation methods can be used for spraying protection. Generally, this is applied for workpieces with large quantity. Assembly Tooling/Gauge: when in the assembly, in order to ensure that the size of the application required by the customer is installed correctly and precisely in the assembly, we should make complete inspection on the size and screw with assembly tooling and gauge, such as 19 inches hole spacing. Bending Inspection Tools: for batch and complex workpieces, this must be considered by the process engineer in the process of making the product. Hi my friend! I wish to say that this article is amazing, great written and come with almost all significant infos. I?¦d like to peer extra posts like this .